Enjoy the last overs and watch the best players, without match day traffic worries. To ensure you do not miss any of the day’s play, why not escape from the rigid nature of scheduled rail timetables or soul destroying traffic jams by using helicopter to travel to your domestic or international cricket match. Stay until the end of each game without worrying about your transport home by using a helicopter to fly you back at the end of the last ball and hopefully after the celebrations have finished. Improve your chances of seeing the ball hit for six by using a helicopter to arrive at the various cricket grounds around the UK. You will arrive in plenty of time to experience the electric atmosphere of watching both teams play the entire innings, weather permitting. Flexible transport is vital for cricket fans as matches are often delayed with weather or poor light. Similarly, they may be cut short with a team being “all out” quicker than expected. Either way, if you are tied to a scheduled timetable this causes you to miss the end of the match or spend a long time waiting, neither of which scenario applies to you when you are using a helicopter for your travel arrangements. Enjoy the last overs and watch the best players in action, safe in the knowledge that you will not have to rush off to beat the match day traffic. If the cricket match finishes early you will not be left stranded as we provide you with the flexibility to leave when you want. Stay until the end, watching thrilling and prestigious matches or leave early if rain stop plays. 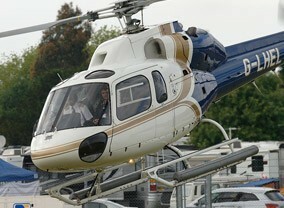 There is no quicker and more comfortable way to travel to cricket matches than by your very own luxury helicopter. The luxurious and comfortable interiors inside the helicopters makes this the ultimate way to travel, so you arrive refreshed and ready to enjoy a great cricket match. Fans will be able to get into the mood during the journey by enjoying a few drinks and singing songs on the way without worrying about being too noisy for fellow passengers. Flying from a site near your home means you spend less time travelling and more time relaxing and watching the cricket, giving you more opportunity to watch a match as you will need less time away from both home and office. Cricket hospitality packages are also available from Atlas Helicopters for those that wish to impress clients with great bespoke hospitality packages; fantastic food combined with magnificent views and top level luxury as a given. To reserve your flight or to find out more about flying by a helicopter to a cricket match please call our team now.